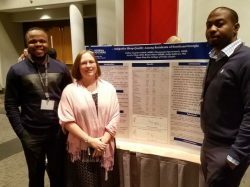 Dr. Kelly Sullivan, assistant professor of epidemiology at the Jiann-Ping Hsu College of Public Health Georgia Southern University, recently took a group of first year MPH Epidemiology students to present research at the Rural Health Conference at the University of Alabama. They gave one oral presentation and presented 3 posters highlighting research they have conducted this semester. The poster entitled, “Subjective sleep quality among residents of Southeast Georgia,” authored by Mr. Collins Onyeka Ordiah, Mr. Oluwaseun Oguntomole, Ms. Aurela Nikaj, and Mr. Bruno Okoro received 1st place in the student division. These experiences and opportunities for publication are enhancing epidemiology students’ preparedness to serve as leaders in public health and providing a strong foundation for their future academic and career endeavors, while advancing the mission of JPHCOPH.